"They usually live along the lake and valley, so it creates a beautiful and fabulous picture of Hoa Binh. With humid subtropical climate and and many strange highlands, Hoa Binh has typical climate of Viet Nam mountainous area and diverse traditional sights. The best period to view the mystery and captivating beauty of Hoa Binh is between January and February. In these period of time, all mountains in Hoa Binh are covered with cherry blossom and plum blossom hiding among the moist fog." Hoa Binh - means in Vietnamese "peace" and is the name of the capital city and the province. 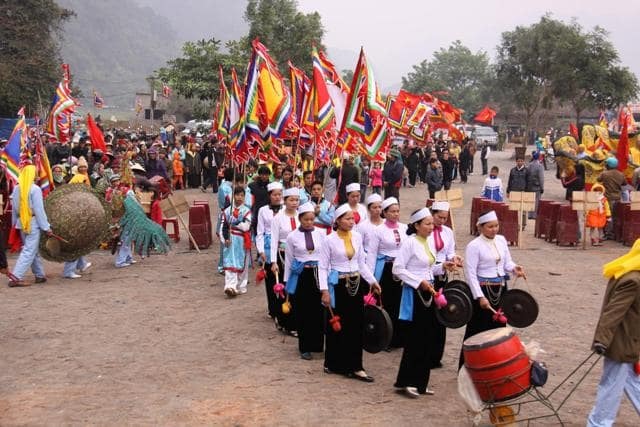 Hoa Binh province is proud to be one of the oldest areas in Vietnam with the world famous "Hoabinhian Culture". The city is located 76 kilometers from Hanoi. The climate in the province is representative of the tropical monsoon, which is quite cold and less rain in the winter and hot and rainy in summer. The temperature here is between 15-29 degrees Celsius, depending on the season. Hoa Binh is also one of the oldest countries in the world where human life is found The country has a long history. There are human remains found from 10000-2000 BC. There are still archaeological remains, precious relics, which the prosperous period of Viet-Muong demonstrate ancient culture. Hoa Binh is a mountainous province west of Hanoi. The province has several high mountains, ancient forests, caves, rivers, lakes and mineral water with a high mineral content, which are valuable for tourism development. Hoa Binh is the province of the many ethnic minorities. The seven largest minorities are the Muong, Thai, Tay, Dao, Mong, the Chinese and the Kinh. Each ethnic minority has preserved its own unique culture. In total there are around 800,000, of which the Muong account for about 63%. The province is mountainous and there have formed caves, such as Thac Bo Cave, Ret cave and Hoa Tien cave. There is a pristine rainforest "Pu Nooc" where adventurous tourists can climb, hiking, hunting or swimming in natural resources. Man and nature have shaped the dreamy Da river, to further develop tourism. The lifestyle of the Muong, Dao, Tay, where they live along the lake and in the valley, ensures beautiful pictures. Hoa Binh is a province with many hot mineral springs and mysterious valleys. Kim Boi mineral water source has an annealing temperature of 34 to 36 degrees. The water is used for drinking, bathing and medicinal treatments. The water from this source has almost the same composition as some well-known foreign brands of mineral water world. In addition, it is believed, that heated water has more dissolved solids and so it has a high mineral content such as calcium or lithium, or radium. Therefore, this water is a very effective therapy for rheumatism, intestinal disorders, abdominal pain, high blood pressure etc. Thung Nai is an ideal place for ecotourism. You can sail on the romantic green surface of the Da River. Along winding streams and beautiful scenery on both banks. Thung Nai is particularly suitable for tourists who are looking for quiet relaxation with family or friends. Here you will forget all the stress of busy life and you can enjoy the magnificent natural wonder. Thung Nai is also regarded as "Ha Long Bay on land". In the valley of Mai Chau you can admire the rice fields and the houses on stilts, which are still preserved. 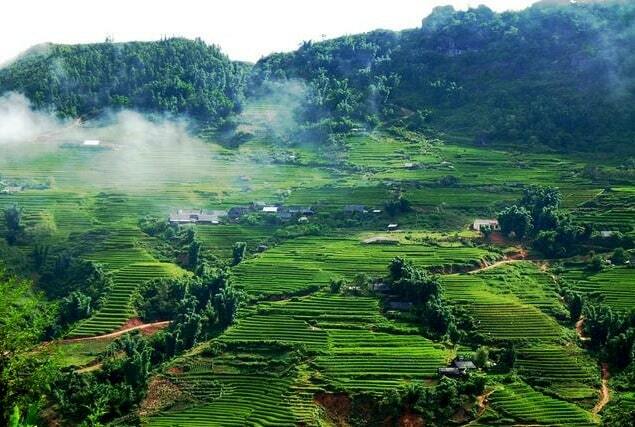 At present time there are more than 50 villages in Hoa Binh, which you can visit. Lac Village (in Mai Chau valley) and Muong Village (10 km from Hoa Binh) are the most famous villages. 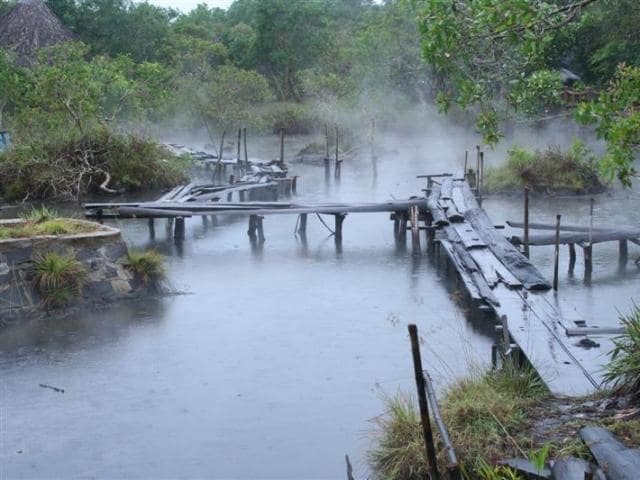 These villages have been designated by the authorities for ecotourism. In addition, visitors are advised to visit the Culture and Tourism Village in Dong Mo. The village has a Vietnamese ethnic traditional architecture and was created with the aim of preserving the Vietnamese culture. Many villages are a maximum distance of 3 km from Mai Chau. These villages are very easy to reach - you can rent a bike or you can walk. If you want to visit a market, the Pa Co Sunday Market is a good option. It is located about 20 km from Mai Chau, on the road to Moc Chau. Many villagers come from mountain villages to buy or sell almost anything. Minorities are here in the majority. The market is a "must" for anyone looking for a few good souvenirs. The market is even a good option to buy special products, such as honey, fresh fruits and vegetables, live fish, eels, snails or Vietnamese delicacies. There are also traditional brocade woven products for sale, made by skilled Thai women. The Sunday Market attracts a lot of customers. It is colourful with vivid sights and smells will tickle your senses. Indulge your taste buds with authentic traditional Thai cuisine, and taste of the rice wine, which is made in the villages.